Seeing is Believing – Try a Product Near You. Our mobile showroom is on the road! 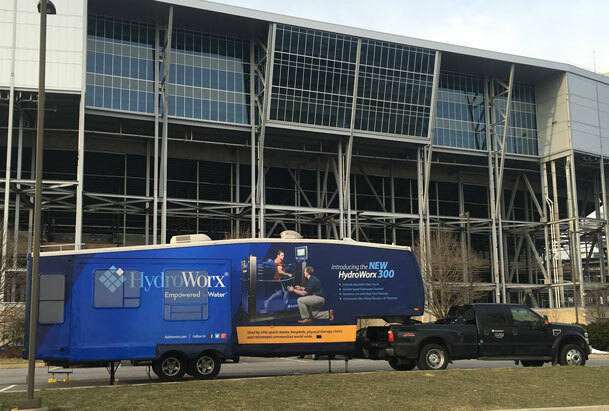 Schedule a HydroWorx mobile showroom appointment by requesting a stop below and we’ll drive it to your door so you can experience HydroWorx technology and its benefits. Our fully enclosed, temperature controlled mobile showroom, is an ideal environment to educate facility owners about the benefits of aquatic therapy. In addition, private demonstrations at one of our hundreds of customers is also an option. We’ll even pay you for the experience! Should you choose to try a HydroWorx pool, we will gladly refund the cost of your airfare or traveling expenses (up to $500) upon your purchase of any HydroWorx pool*. Call 800.753.9633 or fill out the Contact Us Form and we’ll help you find the most convenient location to test out the amazing HydroWorx pool used by elite sports and healthcare institutions throughout the world. Offer does not include driving related expenses. *Not valid with any other offers.